Pronouns prevent unnecessary repetition of nouns. If they refer back to a noun or pronoun, that word is known as the antecedent. The chairperson (antecedent) was reading board papers when she (pronoun) heard the media announcement. There are several different types of pronouns. Personal pronouns usually refer to people but they can also refer to objects, places or qualities. Joe was a good worker and he often worked overtime. Grammar is confusing because it is so complex. 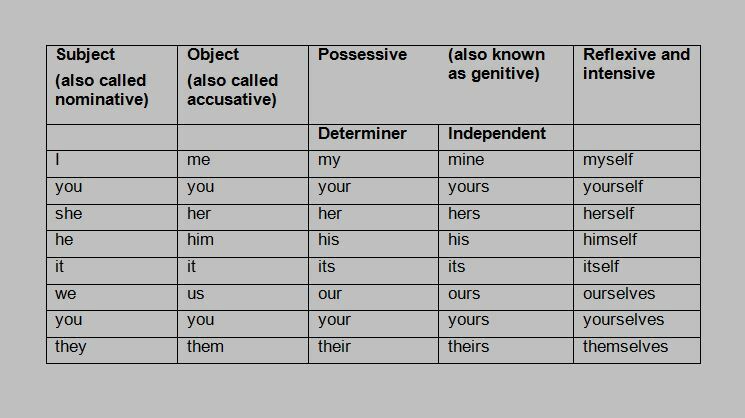 Possessive pronouns indicate ownership and take two forms – determiners or on their own. Determiner: That is her project. Possessive pronoun: That project is hers. Reflexive nouns end in self or selves and refer back to a noun or pronoun mentioned earlier in the sentence. She took a selfie of herself at the conference. Emphatic pronouns take the same form as reflexive pronouns and intensify a statement. I myself think workplace bullying is unacceptable. Relative pronouns introduce clauses that relate to a previous noun or pronoun (antecedent). The relative pronouns are that, which, who, whom, whose, whoever and whomever. The manager who bullied me has resigned. The email that I sent to the wrong client bounced back. Read more about who and whom. Demonstrative pronouns demonstrate or point things out. They are this, that, these and those. That was a great performance review. Those comments about your performance are true. We use interrogative pronouns to ask questions that start with who, what, which, whose, whom. Who is taking the minutes? Indefinite pronouns refer to unspecified persons, objects or things. They include anyone, no one, all, many, some. No-one knew who started the rumour. Many were surprised by the restructure.